Jo joined the Pet Health Partnership in July 2016. Jo has three children who keep her busy and has two chilled out cats and a cheeky Labrador. Jo loves being in the hustle and bustle of the Wareham team. 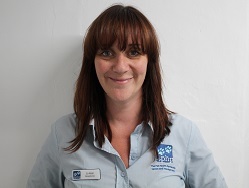 As well as being our Front of house receptionist she also supports the nursing team and is our clinic First Aider.